Here's the work of Al Parker, my idea of The Great One among illustrators. Illustrations don't get better than this. The complete double page spread is shown below. It's the usual copy to induce readers to think about making travel plans. 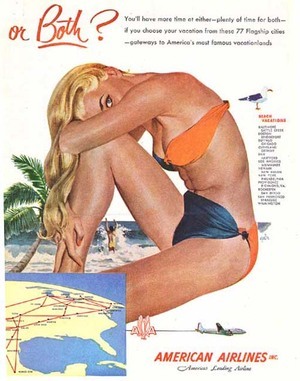 The two people with their fishing gear is a predictable illustration; the fetching young woman in the mid-century bikini is where Parker makes his skill as an illustrator so obvious. I swear that you can smell her sun-tan lotion. 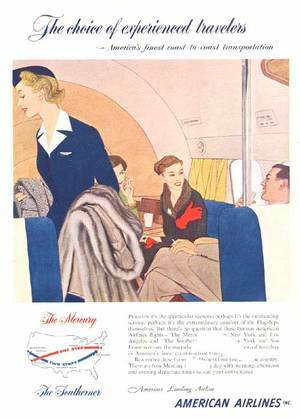 Another one of the great ads he did for American Airlines. It's obvious and it's been done a thousand times or more, but not as well as Al Parker could do it. A more typical solution. You can see that Parker was doing his best with what he was asked to do. 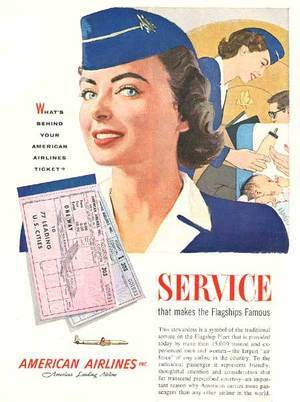 A dull and boring setup that he energized by rendering a personable ticket agent and a sophisticated traveller. Same boring concept probably dictated by the client, except that Parker has saved it with a very restrained drawing technique. What could be worse than this? Back view of travellers approaching the plane. 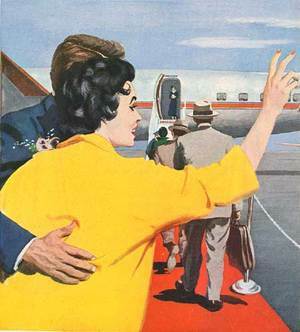 Yes, that's the way we used to board planes in those days. Sometimes we had to run, with crew running along with us. 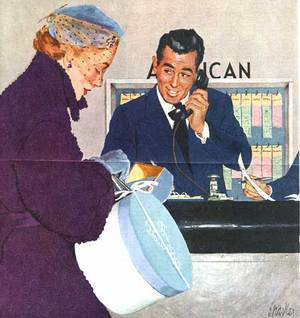 Once again, Al Parker saves the day with a very fine portrait of a flight attendant, known as stewardesses then and not averse to helping with the baby. Here he has taken a mundane situation and made an exceptionally good portrait out of it. i have a large oil painting done on board that Al Parker did that you would swear was done by Norman Rockwell that is clearly signed Parker. Thank you, Jolyn. My bad. I'll correct it at once. Dad remembers Joe DeMers saying how good it was and it was sold to Good Housekeeping for a story illustration. We have the tear sheet here in Dad's folio of illustrations. 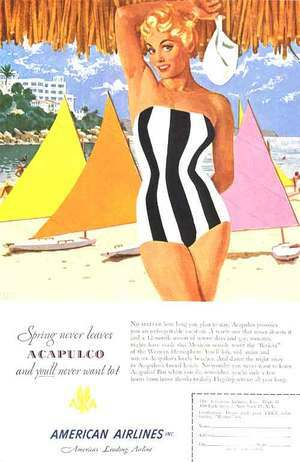 I guess you can see by the style of the illustration that Dad was a great fan of Al Parker's and influenced greatly by him. Dad was checking out Leif Peng's Today's Inspiration blog site and found this posting and said "Hey, that's not an Al Parker." I thought you folks should know. I have an original Al Parker illustration which he gave to my Mother when both she and he were living in New Orleans sometime prior to 1946. I have no idea as to its value. If someone can provide information, I would be happy to send a pic via e-mail. Many thanks, Marty -- Look for more, coming up real soon. The women he drew were beautiful. The age of style and class is gone. It's great to see ephemera like this in the spotlight. Very interesting. Great blog!